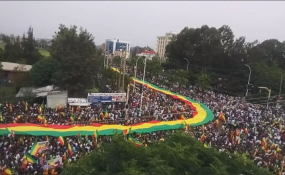 Residents of Bahir Dar, the capital of the Amhara regional state, rally in support of Prime Minister Abiy Ahmed. Addis Abeba — Ethiopia is in the midst of a political transition. There is genuine elation that the rule of violence has ended and a democratically elected government is in the offing. Yet, there is collective anxiety that this transition could become another false start to democracy. A sense of déjà vu looms large. In the early days of the 1974 Ethiopian Revolution, hope for a "provisional people's government" was quickly dashed by a counterrevolution. The opportunity for a transition to a democratic multinational federation that the regime change of 1991 offered was scuttled by the Ethiopian People's Revolutionary Democratic Front (EPRDF), which instead chose to inflame ethnic tensions and employ violence to suppress dissent to ensconce itself in power. Even after consolidating power, the EPRDF squandered several opportunities to embark on a path of democratization. In the wake of the 1998-2000 war with Eritrea, the heightened patriotic commitment Ethiopians displayed could have been used to increase citizen participation in the country's political life. The then prime minister Meles Zenawi exploited the conflict to decimate his political opponents within the ruling party and consolidate personalist power. The relatively competitive national elections of 2005 was another conjuncture to accept the election results and negotiate transferring to or sharing power with the opposition. Characteristically, the EPRDF leader used the opportunity to obliterate the opposition, encourage political polarization and firmly install an authoritarian regime to rule indefinitely. Windows for the long-awaited democracy were subsequently shattered and turned into occasions for valorization of violence. The failure to democratize from above resulted in a revolution from below. The qeerroo protest movement that started in the Oromia region in April 2014 demanding respect for constitutionally guaranteed rights was transformed at the Irreecha festival on October 2, 2016 into a sustained demand for an end to EPRDF's rule of violence. The slogan, "Down, Down with the Wayyanne/TPLF," heard at the festival, reverberated through Oromia and other regions of Ethiopia, underscoring that nothing short of the regime's ouster would satisfy the protestors' demands. It soon became clear that the infrastructure of dominant party rule had been severely weakened by the unrelenting pressure of the youth-led movement. In the end, the protest movement triumphed despite the indescribable violence the government had unleashed against its own citizens. On December 30, 2017, the EPRDF executive committee issued a manifesto in which it took responsibility and apologized for increasing political crises, destabilizing the country, causing tremendous human suffering and preventing democratic values and institutions from taking root for quarter century. The joint appearance of the chairpersons of EPRDF's four coalition partners to announce the party's decisions marked the end of Tigray People's Liberation Front (TPLF) authoritarian stint and the beginning of political transition in Ethiopia. If it succeeds, this will be the first nonviolent transition in the country's recent history. In this article, I assess Ethiopia's transition in the context of a "transitology" model known as the "transition paradigm," popularized in the 1990s as a universal paradigm for understanding democratization. My goal is not to test a model but to stress the need for a programmatic approach that encompasses elite political bargaining and extensive public participation in Ethiopia's transition. Failing this, there are two possible scenarios. One is a stalled democratization that will result in a semi-authoritarian hybrid regime, which combines electoral competition with varying degrees of autocracy akin to the regimes that emerged in the 1990s in much of Africa, the former Soviet Union, and in parts of Central Europe, East Asia, and the Americas. The other possibility is a failed state. This time, the transition must succeed to obviate either outcome and to facilitate the fulfillment of the longstanding demand for the establishment of a participatory democracy in Ethiopia. To manage transitions competently, the political actors in the transition do not have to repeat the mistakes of failed or stalled transitions. Thirty countries have transitioned from authoritarian to substantive democracy between 1974 and 1990. By the mid-1990s, thirty-six other regimes had become competitive authoritarian, exceeding the number of democracies among developing and post-communist countries. Experiences of both success and failure abound. Sufficient knowledge about transitions exists to provide a framework to understand the dramatic political developments that occur during the tumultuous period set between the defunct authoritarian regime and the anticipated democracy. The "transition paradigm" envisages three modes of transition: transformation, transplacement and replacement. Transformation assumes a transition triggered by the existing regime, which introduces reforms that end authoritarian rule and pave the way for democracy to emerge. In this model, the incumbent is in charge of the transition with tremendous capacity to shape the nature of the new democracy without consultation or negotiations with opposition forces. In transplacement context, transition emerges from a stalemate between the incumbent and opposition forces. Realizing that each side cannot triumph over the other, the opposing forces reach a compromise and decide jointly to usher in political transition. The ensuing democracy is heavily conditioned by the nature of the political bargain both sides make during the transition. The last modality, replacement, occurs when the authoritarian regime resists reforms and is toppled by the opposition. In this situation, the new government directs the transition process and shapes the ensuing democracy. The first modality, transformation, is not the path Ethiopian transition has taken despite the widespread impression that the EPRDF's new leaders are in charge of the reform process. The regime accepted reform after it exhausted all of its capacity to inflict violence on the people demanding their rights. After the failed state of emergency in 2016, EPRDF officials realized that they could no longer suppress the escalating protests. By the time of the executive committee meeting of late 2017, the government had no choice but to bow to the protestors' demands. Despite repeated claims that the current leaders are in charge of the reform endeavor, they have in fact little capacity or credibility to implement new policies much less lead the transition. Beginning with the Master Plan, a series of policy initiatives were canceled because of opposition from the public. The steps taken so far are not evidence of EPRDF leaders' programmatic choices, but inevitable measures of course correction. Transformation from above is not the course Ethiopia's transition has taken. Neither is translplacement the model Ethiopia's transition has embarked on. In the Ethiopian case, the political players that matter in the transition are the incumbent government and the youth protestors now known as the qeerroo and, to an extent, protestors in other regions. The existing political parties, decimated by the ruling party, are bereft of cohesive leadership and organizational capacity. Those that returned from abroad are strangers to the domestic political scene and are still groping to grasp at the turning spokes of change. The government retains some level of coercive power to shape the purpose, course and goal of the transition. But it has little leverage on to make an independent policy choice of its own and implement it without the consent of the protestors. The qeerroo and its emerging counterparts (the Amhara fanno, the Sidama ejetto, the Gurage Zerma, the Somali berberta, the Dawro lakayto etc) in other regions are not organized to function as a political party to go head-to-head with the EPRDF. Qeerroo is an organized social movement that shattered EPRDF's shroud of unassailability and invincibility. Considering the level of concession that the regime has made so far, it is clear that the incumbent possesses limited power vis-à-vis the qeerroo. Thus, the transition is not the result of a compromise between the government and an equally powerful political opposition. The replacement modality is not a path Ethiopia's transition has taken either. Many suggest the appointment of a new prime minister constitutes a peaceful transfer of power. This simply is not the case. The reformists' apparent triumph within the EPRDF does not mean a new government has taken over power. The EPRDF might have undergone "deep renewal" but it is not clear that the new cohort in leadership has firm control over the party and state structure to implement needed reforms. The old guard of the ruling party, though unable to engineer a return to power, retains residual power enough to sabotage the transition. The new leaders' ascendancy may be viewed as a rupture with the authoritarian past but the EPDRF is still in power and the authoritarian structure still in place. Replacement is not the path of the transition. Though not fitting any of the modalities of the "transition paradigm," Ethiopia's transition appears likely to go through three sequential phases: opening, breakthrough and consolidation. The opening began with the Oromo protests which pry opened the political system. The reformist phase commenced with the executive committee meeting of December 2017 and in earnest with the appointment of a new prime minister in April 2018. A breakthrough can be achieved if the government forges a political bargain with opposition forces and produces a roadmap and timeline leading to a national election and ultimately a democratically elected new government. Until this is achieved, it is not possible to proceed to the consolidation phase where democratic norms, institutions, attitudes emerge, and new democratic rules of the game become firmly established. The destination is clear. The road there is not. Currently, the transition, as it were, is in a political limbo between the promising opening of the system and expected attainment of breakthrough. This vacuum has created a condition of guesswork, disoriented the reformist camp and emboldened the forces of reaction. The danger of derailment is real. Democratic transitions might stall in a situation that comprises some features of democratic political life and authoritarian traits. Marina Ottaway characterizes this situation of permanently stalled democratic transition as semi-authoritarian, "a hybrid political regime which combines a 'façade' of acceptance of liberal democracy, the existence of some formal democratic institutions and respect for a limited sphere of civil and political liberties with ... essentially illiberal or even authoritarian traits. "1 In practice, semi-authoritarian regimes maintain the appearance of democracy without exposing themselves to the political risks free competition entails, that is losing power. They allow little competition for power using tactics that seem to respect the rule of law but in fact use the law to suppress opposition and competition. At the core of semi-authoritarian states lies a mechanism that effectively prevents the transfer of power through free elections from the incumbent to a new elite or group. In Ethiopia, the new leaders have made promises to repeal or replace blatantly unconstitutional laws that have decimated legal opposition. But parliament has yet to act on the electoral law, party registration law and press law that were designed to ensure the dominant party victory in elections. The district and precinct level elections that were scheduled for May 2018 were postponed by a government fiat. Political operatives associated with the ruling party are now calling for postponing the scheduled national elections in 2020, condescendingly suggesting that the opposition acquire governance experience at the district levels before running for national elections. More ominously, government officials threaten to use force to tame some "rogue" political parties in the name of establishing the rule of law. There has been no meaningful conversation with the opposition to produce a program of transition. There is literally no popular participation to create a national consensus on important political issues. With low-level of political participation, poor performance in delivering government services and frequent abuse of the law by governmental officials, the signs of stalled transition and semi-authoritarian direction are becoming apparent. An outcome of a political transition is often determined by the "choice" the actors in the transition make and by structural factors. Some experts maintain that structural factors such social and economic conditions, political and institutional legacies, and the demographic and cultural aspects of the society in transition have no detrimental influence on the outcome. There is no denying that these factors do present an apparent risk to Ethiopia's transition. Here, I focus on the "choice factor" because it is a task that can be accomplished by actors in the transition and is not at all curtailed by the existence of structural factors. In his study of transitions in Rwanda, Burundi and South Africa, René Lemarchand identifies three categories of choice-factor: the nature of the transition bargain, the quality of leadership skills and the characteristics of opposition movements. "2 I use his categories to analyze the Ethiopian situation. As noted earlier, the way the current political transition in Ethiopia originated and unfolded does not fit perfectly the modalities of the "transition paradigm." The youth protestors who precipitated the breakdown of the old regime had no visible leadership that could have struck a political bargain with the beleaguered regime. To date, a transition bargain to trade off the conflicting claims of the political actors in the transition has not taken place. New players have now flocked into the expanded political space and engaged in the political game with no rules of engagement in place. Political parties are now jockeying to claim their role and place in the coming democratic dispensation. If rules of the game are not negotiated and established soon, the present political competition is likely to escalate to open conflict that cannot be contained. A broad-based political bargain is a sine qua non for the success of the transition. This brings us to the second element of choice, leadership skills. This period of transition is the ultimate defining moment that shapes the future of democracy in Ethiopia and indeed the viability of the country itself. Success is contingent upon the leaders' ability to craft a consensus on fundamental political issues that will affect the fate of the country itself. Whether the polity will remain united depends partly upon the choices a handful of leaders make. Despite the elation, ululation and national euphoria that has enveloped the national mood, and even the international excitement surrounding the election of a "young, vibrant and energetic prime minister," the desirable capacities to create a political will and national resolve have not been demonstrated by the new leaders of the country. Finally, the third element of choice, the role of opposition movements should be taken into account. In a fluid political space without a skilled political leadership, opposition groups' unwillingness to negotiate may lead to violence. Some in the opposition seem stuck in the events of 1991 and 2005, almost invariably reciting experiences of betrayal and vow not to repeat them again. They fail to understand the Oromo protests have completely scrambled the old array of political forces and inaugurated a new political dispensation. Misreading the national mood, some in the opposition seek to play hardball with the government, perhaps hoping to force it to come to the political bargaining table. While their desperation is understandable, they must rise over the petty political gamesmanship and work to de-escalate tensions. The price of playing the role of the spoiler is very high. If violence is intentionally unleashed to create chaos, the transition may be derailed. The country is already in chaos. The murder, mayhem and dislocation of people that have been perpetrated in the eastern, southeastern and southern regions of the country have now spread to western Ethiopia. Armed marauders have made incursions into the Oromia districts in the Amhara Zone from the neighboring Afar region. Nearly hundred thousand have been displaced from the Benishangul Gumz region in the last two weeks. These are examples of ongoing instability that can create insecurity. Faced with insecurity, people who would otherwise be enthusiastic supporters of change harken to the security provided by the iron-feast rule of the old regime. In some spaces, the diehard defenders of the old regime are moving forward with a strategy of inciting people in the political and physical peripheries through monetary enticement, promises of Rambonisque adventurism and promotion of outright banditry. These occurrences pose a mortal danger to a peaceful transition and pave the way for a semi-authoritarian hybrid regime. The opposition must help obviate this eventuality through responsible behavior and positive engagement with the government. Marina Ottaway., Democracy Challenged. The Rise of Semi-Authoritarian Regimes, Washington D.C., Carnegie Endowment for International Peace (2003).